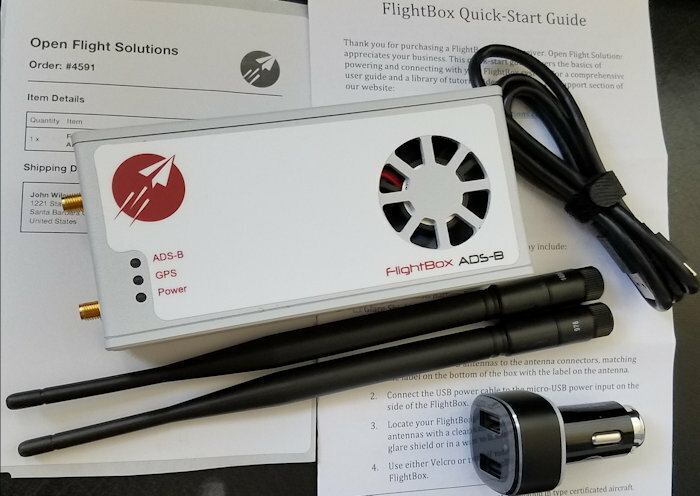 This is an article describing the initial setup process of an Open Flight Solutions FlightBox Plus ADS-B receiver with the C.Young open source “Stratux” software, for weather and traffic information on Avare 7.8.6 for use in a C-172 with Garmin GTX335 ADS-B Out transponder configured with the ADS-B “In capable” code On. This article will focus on indoor ground initial setup and won’t describe in-flight use or Stratux receiver building and programming, but is likely to provide info useful for initial setup of any Stratux receiver for use with Avare. NOTE: I may update this article as the installation and testing progresses, likely over a period of a week or more, and even longer if something new is noted later. Testing and setup began Feb.14, 2016 with Avare and its Downloads updated on that date so some aspects may change at a later date. 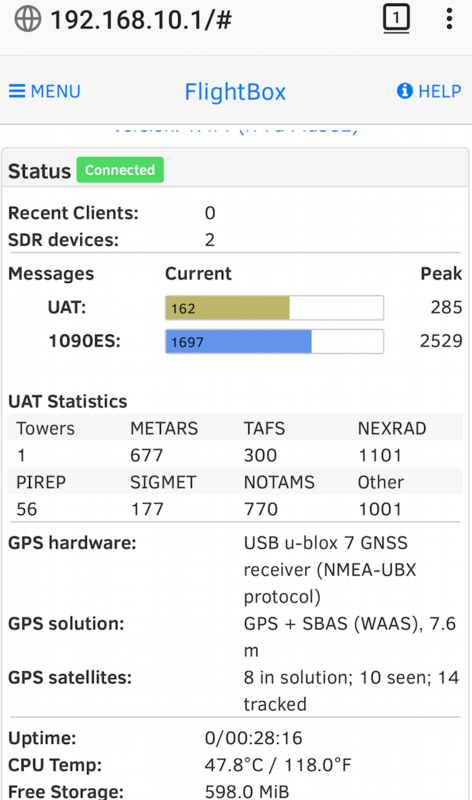 Note that ADS-B In UAT air traffic information is severely limited in aircraft not equipped with ADS-B Out, due to current FAA TIS-B configuration. If you do fly an aircraft with ADS-B Out, to get full UAT traffic you must configure its transponder to send the “ADS-B In capable” code (some installers don’t do this unless you demand it). ADS-B In is an FAA “Next Gen” aviation product that integrates with their other new products to provide pilots with near real-time air traffic (TIS-B), and much more flight info including graphical weather radar (FIS-B). 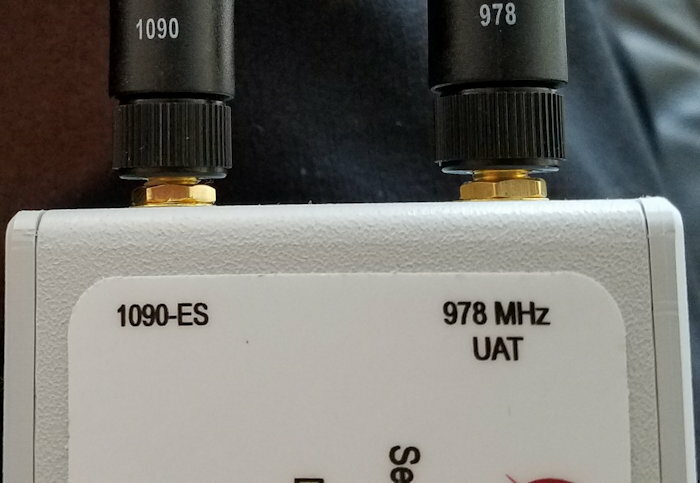 There are two associated frequency channels: 1090MHz ES air-to-air traffic info, and 978MHz UAT providing TIS-B traffic plus the extensive FIS-B products from a network of FAA ground-to-air stations. Depending on configuration, an inexpensive receiver running the free Stratux software can simultaneously provide both of these free pilot info service channels. NOTE: There is no reliable FIS-B ground reception in most areas, so initial setup like this typically relies on more ubiquitous TIS-B for validation. I do get FIS-B reception indoors at home, so had the rare good fortune of being able to also validate with that. My understanding is that like Zubair and the Avare dev team, the Stratux (ends with the letter “X”) software was developed with an open source license by Christopher Young and other volunteers as a service to the aviation community. It provides an inexpensive alternative to the popular commercial product with a similar name (ends with the letter “S”). That other more expensive product apparently won’t reliably work with Avare or other aviation EFB/GPS apps aside from one. 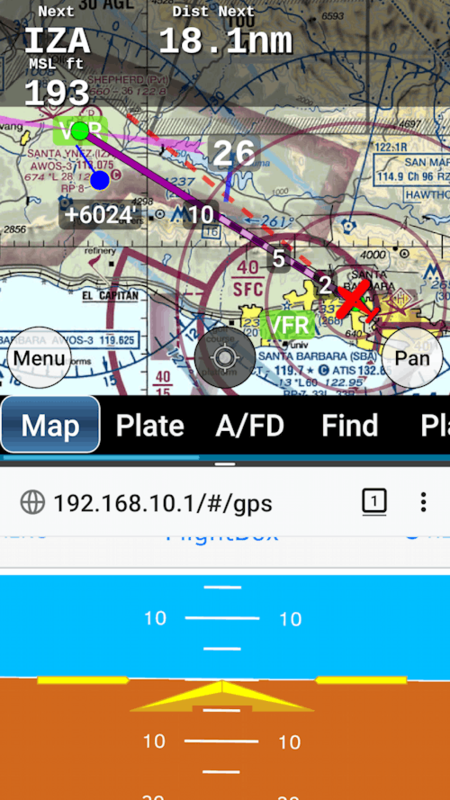 Since I find Avare to be both simple and powerful, and also completely free of fees and ads; and because I favor both open source software and applying scarce funds to flying rather than expensive toys, I chose Stratux. While it’s possible to build a Stratux receiver for less than half what I paid for the FlightBox Plus, I went with this pre-assembled product. My reasoning is that it’s much more likely to contain quality components, it will probably save me at least a couple of hours researching & building, and comes with some support should I encounter problems. Since the designer and builder (Steve Sokol) has built many of these, probably worked with Stratux software designer C.Young, and it has an FCC tag, I’m also assuming it’s top quality. I paid a little extra for the FlightBox Plus model because even though some of its features may not yet be supported by the Stratux software, like Avare the development and refinement of that app is ongoing and is likely to support the extra features sometime soon. Since I fly VFR with a battery powered $10 ADS-B In receiver aboard, I opted not to buy the FlightBox battery backup. Having heard of problems with Ebay and personally experienced problems with Amazon (e.g. fake reviews or those of a related product from a different supplier or for a different model), I chose the FlightBox from among the options recommended on the Chris Bobbe website. The receiver arrived quickly via USPS First Class Package mail in a 9.75 x 4.25 x 2.25″ box, with a ship date of 2/7 matching a 2/7 Mfg Date sticker on the receiver inside. I presume the current Mfg date indicates the latest software and firmware is installed. Box contents included the 5.25 x 2.5 x 1.65″ receiver, two 8″ antennae marked for frequency, a Quick Start Guide and shipping sticker, and a solid little 12-24v cigar lighter dual USB output adapter marked “galaxy-io” “5V-4.8A” and with an aircraft depicted on the shaft. I presume the Chris Bobbe website aircraft logo indicates this adapter is unlikely to interfere with avionics. The case appears to me more robust and refined than most home-built Stratux receivers I’ve seen, aside from some slight burrs on the inside of the side ventilation slots. If it won’t void the 1 year warranty, I’ll open it up to report on the internals and carefully remove those burrs. Click any of my six slightly distorted (it actually has straight edges) cellphone closeup FlightBox Plus pix below to enlarge it. I enjoy figuring stuff out, and when I get a new toy it’s common for me to experiment with it. Before reading the Quick Start Guide I assembled it with the excuse of finding out whether that’s easy. It is. Noting that the two identical length antennae have frequency markings at their bases, I screwed them onto the fittings aligned with frequency markings on the FlightBox back label. Note that you need to use the knurled base of each antenna to hand tighten it securely. In terms of physical hardware, the only other step seems to be plugging it into a USB power source. Before powering it up, next I skimmed the paper Quick Start Guide pamphlet. The FlightBox website has a more detailed User Guide and their site also has video tutorials, though I haven’t yet looked at any. They specify a 2+ Amp USB source and cable, and since I have a cheapo USB power meter I plugged it into my S7 phone’s 2 Amp charger (which for comparison shows about 1.6A when charging my S7 from 15%) and then plugged the FlightBox Plus into that meter. At startup it displayed around 1.5A after a minute or less, at which time the fan very quietly came on (ambient room temp 77F). Inside the case I could see a steady red LED and a blinking green one. On the case top opposite the nearly silent fan three lights eventually all came on – ADS-B: Blue LED, GPS: Red LED, Power: Green LED. Before connecting with Avare, your Android device needs to communicate via WiFi with the Stratux. To do this, I pulled down the top of the Android screen on my S7 phone, tapped the Settings “gear” icon, chose Wi-Fi, and when “FlightBox-(followed by random numbers)” appeared, I tapped that and selected Auto reconnect, then Connect. I either tap Dismiss when the no internet warning appears, or just ignore it. NOTE: If you try this at home and Android auto-connects to your home network, to switch between them in Android Settings for WiFi just tap the one you want, select Auto reconnect, and tap Connect. Another thing to check after turning WiFi is “Smart Network Switch .” Not all Android devices have that but on my S7 phone, I tapped the three vertical dots at the top-right of the WI-FI settings screen then “Advanced” and it’s the second item in the list and was already OFF as desired. To change that setting, both WiFi and Data need to be on. Despite being a couple of feet from my strong home WiFi router and with 5-10 other WiFi sources in range, my S7 never switched or lost connection even when I took the phone or Flightbox 30′ or more from the home router. I tapped the Home button and launched my Firefox web browser, then input on the top address line the 192.168.10.1 “IP” number listed in the Quick Start Guide for the Flightbox Plus. I suggest you Bookmark that page, since it’s very useful. A web page appeared with extensive FlightBox tech details and live data. I explored the Menu items on that web page, and delighted to see that the Stratux was indeed working quite well. I was even seeing UAT data (weather, etc.) indoors, though ground reception is fairly rare in most of the country. I fiddled with items in the MENU and discovered just how much data the FlightBox was collecting. Then I opened WiFi Settings again, switched to my home WiFi, went to the gPlay store, installed the Avare External I/O “helper” app and launched it. On the pulldown menu at the top I selected WiFi then tapped the Listen checkbox. As described in the FlightBox Quick Start Guide I changed the Avare I/O app’s four digit code to 4000. As directed in item 9 on this Avare Forum post about Stratux I checked to see if data was streaming below the —-Output—- line in the Avare I/O app. It wasn’t! Even after trying several things was I unable to get my spiffy new Stratux to feed its wealth of data to Avare I/O! Reading to the end of the above Topic in the Avare Forum, I found this post pointing to a problem with some versions of Android (my S7 phone is running Android 7.0). 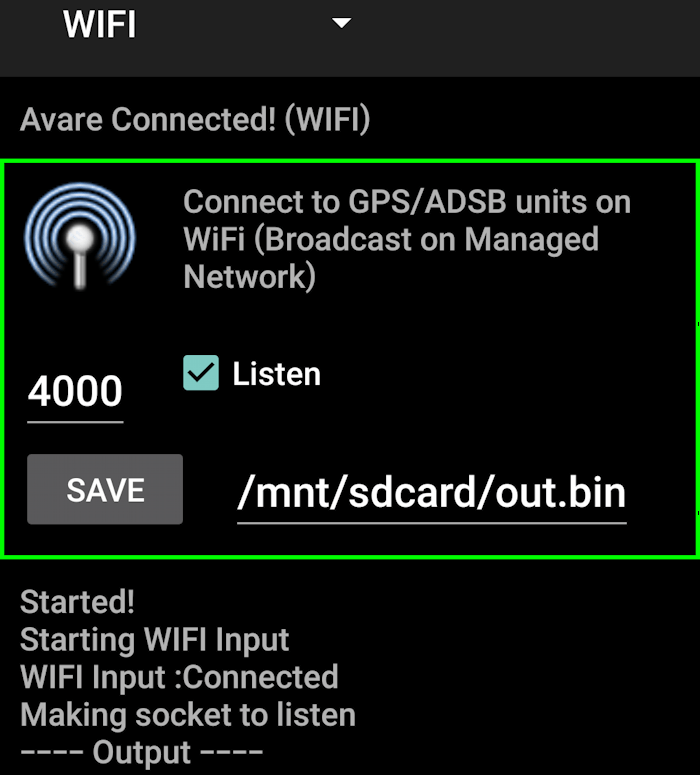 Namely, that when Power Saving is turned on in Android Settings it may disable “background network usage” such as Avare I/O receiving data from the FlightBox. In Android Settings I selected Battery, and under Power Saving Mode I tapped OFF. I then switched back to the Avare I/O app, thrilled to see that it was now happily displaying a rapid stream of data! Next I launched Avare on my s7 phone and when the “Turn On GPS” prompt appeared I tapped No, since Yes would turn on the phone’s internal GPS which would not be used (FlightBox Plus has an excellent WAAS GPS) and thus needlessly consume S7 battery power. In the Map tab of Avare I tapped Menu, Preferences, GPS, GPS Position Source, All Available. Then I tapped Menu, Simulation to toggle it to Navigate mode (otherwise GPS is ignored). Note: When switching my S7 back to using its built-in multi-band GPS for Avare, I found it didn’t work. After using the Android button for Back (right of the Home key) and selecting Exit in Avare, I tapped the Task Manager button (left of the Home key) and swiped Avare off the screen to Close it. With GPS turned Off in Android, I re-launched Avare and hit the Yes button when it asked “Turn On GPS.” That seemed to activate the GPS in Avare when using the Android GPS setting didn’t. I used the same procedure when switching back to the Stratux as GPS source. One of the coolest UAT features is NEXRAD weather radar. 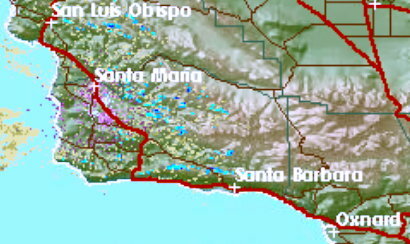 I was seeing slight radar returns on the NWS website with my computer here in the Santa Barbara area, so I was surprised to see none on Avare. I tapped Menu, Display, Select Layer Type, 75 Percent. Then I tapped Menu and the second button in the right column, then under the Select Layer Type tapped NEXRAD. Still nothing, so I checked the FlightBox webpage open in Firefox and tapped its Menu and then Weather options where it said Watching (0) and Recent Reports (10). I tapped on the Recent Reports title and it showed METARS for 10 mostly major airports in the region. There were large and strong radar returns in AZ on my computer’s NWS radar site, so I zoomed Avare’s map screen out to display all the way to TX but still no sign of radar. It could be that since I’m indoors on the ground receiving only one UAT tower, the NEXRAD data isn’t being received by the FlightBox. It could also be that NEXRAD is only sent to aircraft with ADSB-Out. Another possibility is there’s something amiss with Avare’s display of FlightBox radar. In the Firefox display of the FlightBox built-in web page is a line titled UAT Statistics. At that point it showed 2799 below the NEXRAD heading (it was already 1101 in the earlier Firefox screenshot above), so maybe Avare I/O isn’t passing it along to Avare for some reason. I’ll check it again in flight with ADS-B Out active to see if multiple ground stations with solid rain nearby will make a difference. When I tap Menu and then select METAR from that second button in the right column, it shows a green VFR label on every regional airport with a symbol. Zooming out, it shows MVFR on two San Diego area airports among most others showing VFR. So it seems METAR data is reaching Avare correctly. The next day I tried out an idea on my S7 phone and it works great. Since the Flightbox can connect with multiple WiFi receivers simultaneously, I plan to fly Avare on my primary tablet and also have it running on a backup S7 phone. I like the PFD feature in Avare but it’s not useful in flight due to the S7 sensor limitations. I was going to dedicate the S7 to the cool AHRS screen in Firefox, but then recalled the S7’s split screen capability. Check this out. Avare needs to be the active window, but the AHRS in Firefox is active and accurate. At the same time, Avare is showing traffic and METARS (green VFR tag) for my input IZA Destination. It also works in Landscape orientation (see sample at the Apps4Av Forum link below), and I can change the relative screen sizes and zoom the AHRS screen in Firefox if desired to see more of it (like the skid indicator at the top). Tho I fly VFR this will be a great backup to my old “steam” turn/bank and Attitude Indicator instruments. I might get more of Avare’s top Status items to show by reducing the Android font size. That’s it for now. Overall I’m very pleased with the purchase, and happy to have solved a few setup problems. I hope the solutions I’ve found may be useful for others using Stratux with Avare. Next I’ll take it flying and post a new article about that. At some point I hope to also create a how-to video to post on the Apps4Av YouTube Channel. I welcome your comments, questions and feedback in the Apps4Av Forum. This entry was posted in Avare, Other apps, Uncategorized. Bookmark the permalink.